First, a big thanks to all the readers helping me out with all the specialty jersey news lately. You guys are great. That being said, there's a lot to cover today so I'll try to keep it brief. 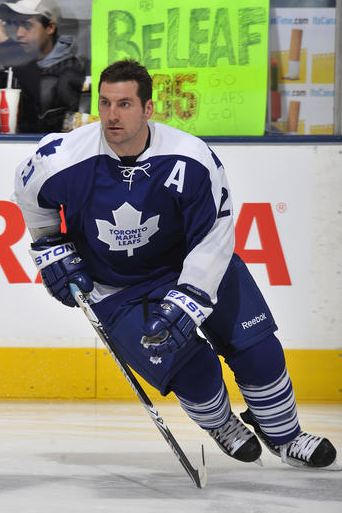 On Tuesday, January 26 the Toronto Maple Leafs wore special throwback sweaters during warm-ups. Leafs' throwback jerseyIn this photo, you see Francois Beauchemin, who usually wears #22, likely wearing Borje Salming's #21 sweater, as Icethetics reader Chris points out. Salming's sweater was honored (not retired) on October 4, 2006. As part of a pre-game tribute to better times, retired fan favourites Dave "Tiger" Williams, Lanny McDonald and Norm Ullman were invited to conduct the ceremonial opening face-off. Toronto players had worn throwback uniforms from the 1970s in their pre-game warm-up. A reader named Michael, a Rangers fan, asked if this could be a sign of things to come. While obviously I can't say for certain, I do know I like it better than their current home jersey. But maybe they could use a dark third as well? But don't get your hopes up. Don't forget, these were only worn during warm-ups, not even for an actual game. But it is still nice to see them every now and then. There are a couple more pictures in this Leafs' photo gallery. In less-awesome jersey news, the San Jose Sharks are auctioning off special edition Valentine's Day jerseys through the Sharks Foundation. Sharks' Valentine's jerseysThey're white practice jerseys, autographed by the players, featuring names in red and small red hearts on the jersey numbers on the back. In fact, this photo to the right depicts very clearly what they look like. Fans can bid on them in a silent auction format. The first half will be available during tonight's game and the other half go up on Tuesday night. If you're a collector or just a fan who wants more details, click here. Of course this isn't the first or last time the Sharks Foundation will hold a special edition jersey auction. Details here. Now we move into the minors where all the real fun starts. 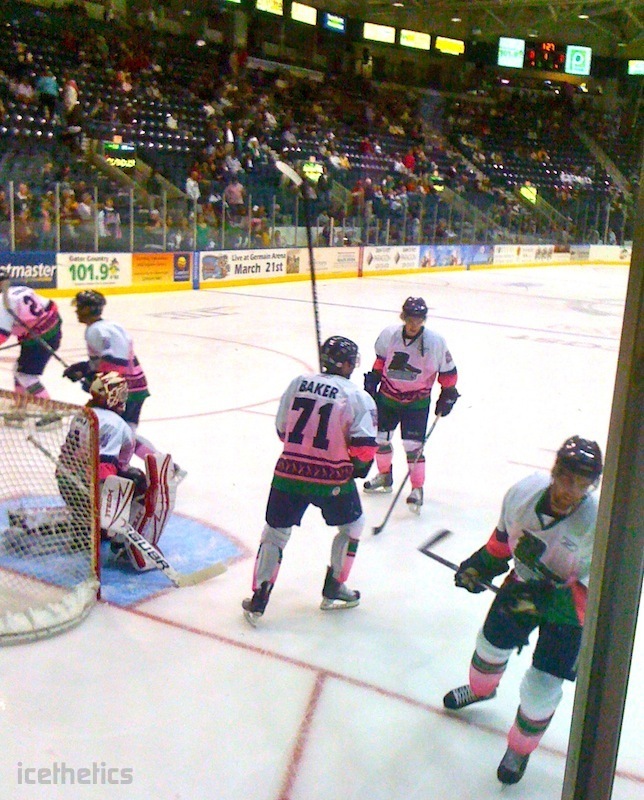 My local team, the ECHL's Florida Everblades, will hold their Pink in the Rink Night on Saturday, February 20. 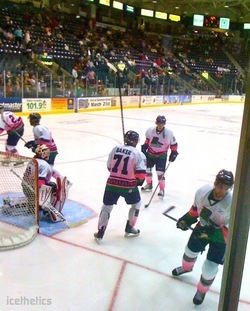 Everblades' Pink in the Rink NightPlayers will wear these pink-infused jerseys when they take on the Kalamazoo Wings. The jerseys will then be auctioned off immediately following the game. Icethetics reader Ian writes in to point out a neat element of the jersey's design. Normally, interlocking alligator teeth make up the middle stripe at the bottom of the sweater. For this special edition breast cancer awareness jersey, alternating pink ribbons give the same effect. Having said that, if you enlarge the image, you'll notice that the right sleeve reads "2009 Pink in the Rink." Presumably, this is the jersey design used last season, or meant for use before January 1. I imagine the jerseys worn next month will feature the updated year. I'll also try to grab some game action photos to share. Another ECHL club, the Johnstown Chiefs, announced plans on Wednesday to wear special jerseys for their Pink in the Rink Night event on January 29.
Credit: The Tribune-DemocratThey did so to the tune of a 5-2 defeat last night at the hands of the Charlotte Checkers. The Chiefs have been holding their annual Pink in the Rink night since the 2007-08 season, and as always the jerseys were auctioned off after the game. This year's event will benefit the Joyce Murtha Breast Care Center. 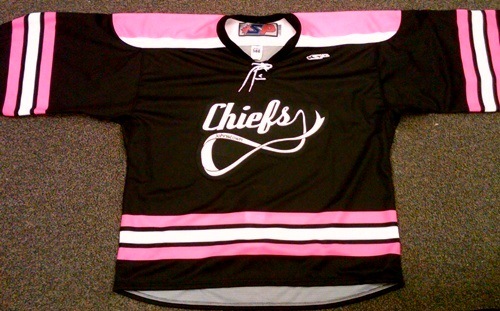 Chiefs' pink jerseyHere's a better look at the special edition sweater. It's basically a Boston Bruins home jersey with gold swapped out for pink. The wordmark is a nice touch, with the attached pink ribbon. That wraps things up for now. There's a lot of other minor league jersey news that I'll be getting to later on. So check back soon for that.